While relatively low in calories, deli ham often contains high amounts of saturated fat and sodium. 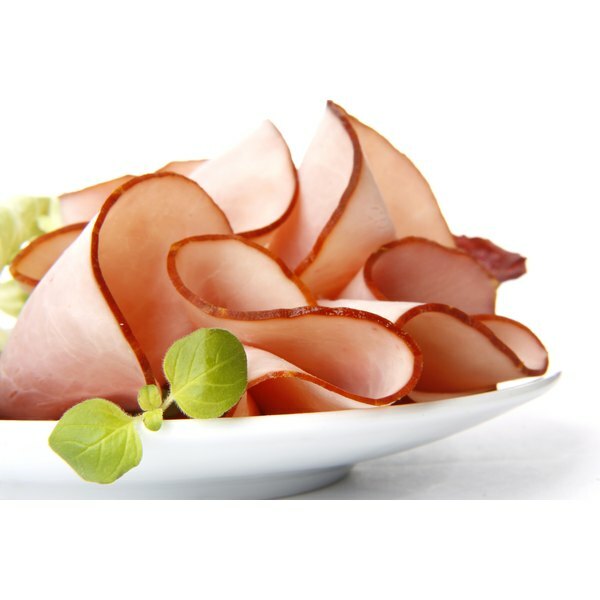 Two ounces of deli ham is approximately 56 grams, or two slices, depending on the fat content. Two ounces of 97-percent fat-free deli ham contains 60 calories, 9 grams of protein, 1 gram of carbs and 2 grams of fat. To minimize the calories, eat the ham with low-fat cheese, vegetables and two small slices of whole-wheat bread. Focus on the fat and sodium content when reading the nutrition label. Try buying deli ham that is greater than 95-percent fat-free and low in sodium. The saturated fat found in deli meat can contribute to high cholesterol and heart disease if you eat too much of it. The average adult should consume less than 16 grams of saturated fat per day. As for sodium, you should aim for less than 140 milligrams per serving. To promote heart health, the American Heart Association recommends that you consume less than 1,500 milligrams of sodium per day .